It has now been two months since I completed the southern half of the AT. Climbing Springer Mountain with my daughter and two granddaughters will always rank high as one of my most cherished memories. 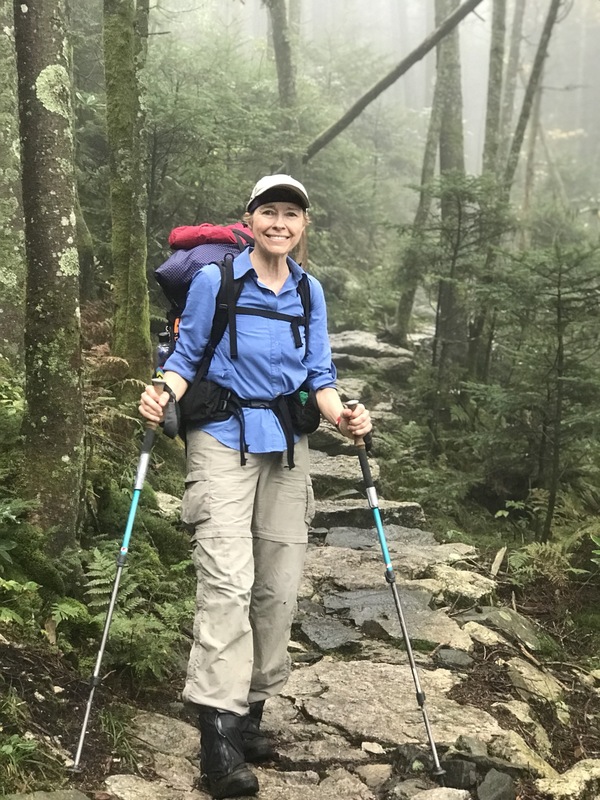 I write this from the comfort of home, with last year’s ten weeks (600 miles) of backpacking behind me and plans for completing the northern half of the trail ahead of me. 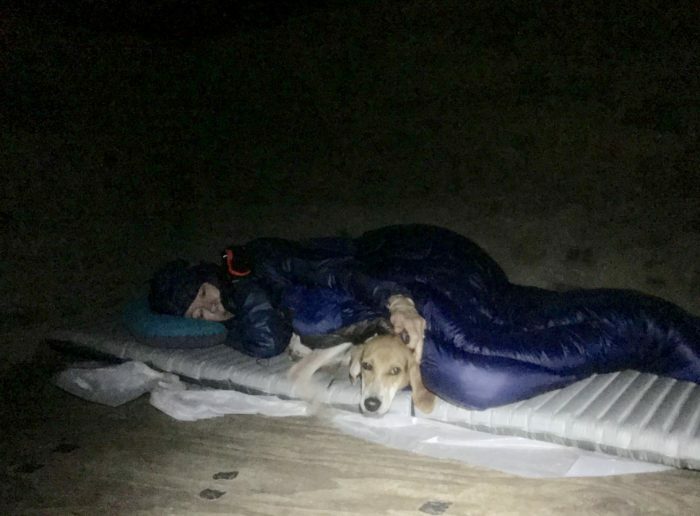 Thinking back on my experiences, I was surprised how exhausted I suddenly became during my final week on the trail. 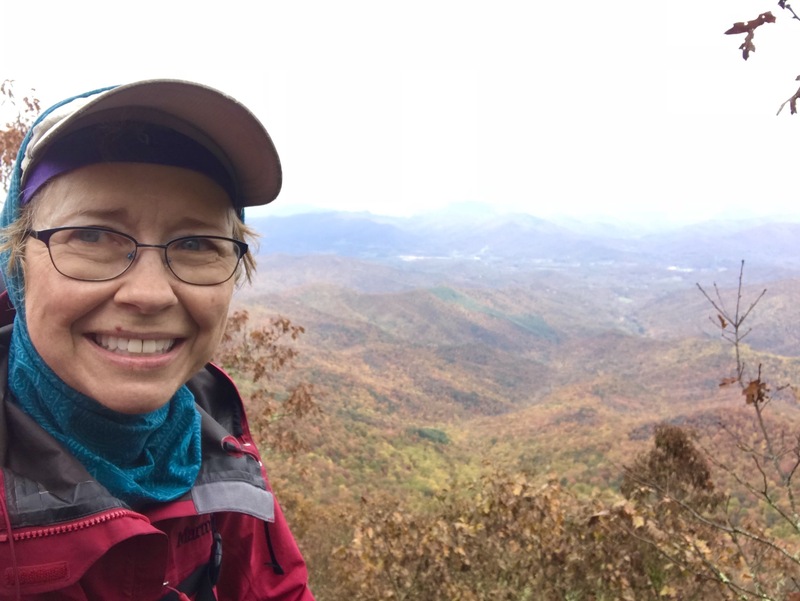 Although I found hiking in the cold fall air invigorating (but could do without the horizontal rain), the frigid camping was more challenging and uncomfortable than I had expected. Having intestinal distress during my final four days was extremely disheartening, but I got through it. 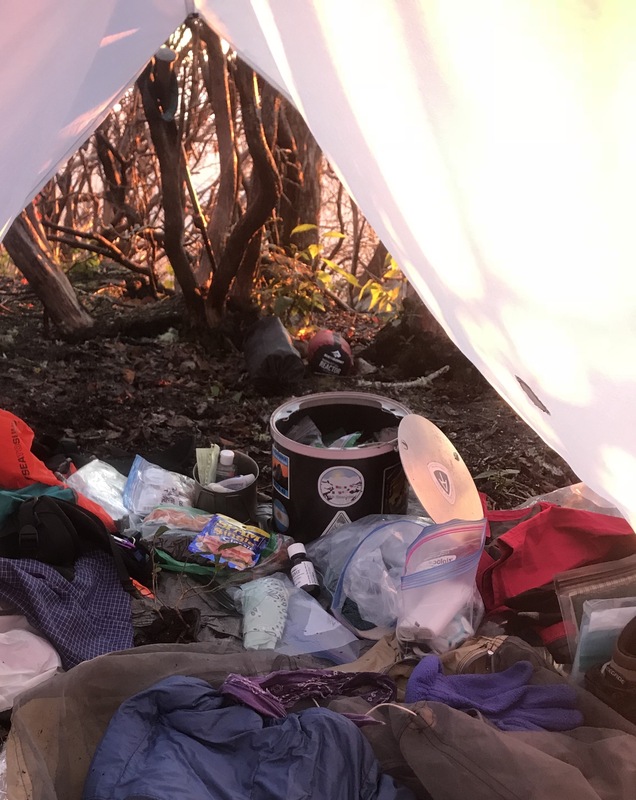 My Guthook app completely froze up on the final day, which showed me how much I had come to depend on it, especially when the trail was well hidden by fallen leaves. I think these were the three main reasons I arrived at Springer Mountain completely spent and ready for recovery at home. So… I have recovered and am starting to get psyched about getting back on the trail on May 1. Even with the uncomfortable final week, it was a wonderful experience. The northern half is now demanding that I walk every inch of it. 1. Start with lower mileage per day for the first week, and gradually increase each week. Call me an over-planner if you like, but I have written itineraries in the past for other long-distance hikes and cycling trips. This has always helped me a great deal in my planning for lodging and the even distribution of my energy. So an itinerary was written for last year’s ten weeks and proved to be a great help. I managed to stick to it in general, sometimes changing my camping sites but always reaching the locations for my zero days as planned. Allowances were made, of course, for four days of waiting out Hurricane Florence. Overall average for 55 days of hiking: 11.2 mpd. Being in my mid-60s and having many dietary restrictions and other occasional health issues, I have found that ten to 12 miles per day are the best for me. I can go up to 14 or 15, but don’t really enjoy it. 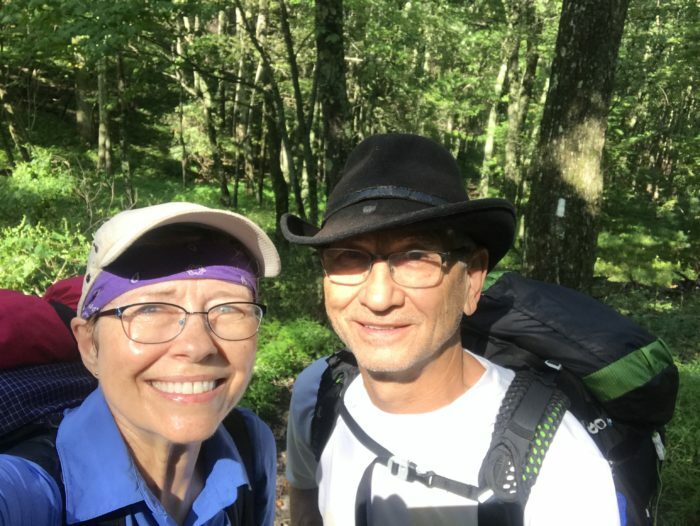 I cherish having time to fully experience nature, to take as many photos as I wish, to enjoy a half-hour+ lunch in a beautiful site, and to chat with other hikers who I encounter along the way. As they say, “The journey is the destination.” I love it this way. 2. Take frequent zero days. I had 55 days of hiking and 13 zero days last year. This sounds like a lot of days off, but some of those were unavoidable, as I waited out the first hurricane. I find it’s best if I average four to five days of hiking between each zero day. My body and mind need this rest. I was able to book a full body massage for one of these days, and tried on two other occasions. I intend to continue this practice whenever possible. Thank you, Bill, for never complaining about the extra expenses that occur. 3. Practice yoga/stretching every morning for ten to 30 minutes. Because of back and hip issues, this is the optimal beginning of every day for me at home. I was able to continue this daily practice on the trail. 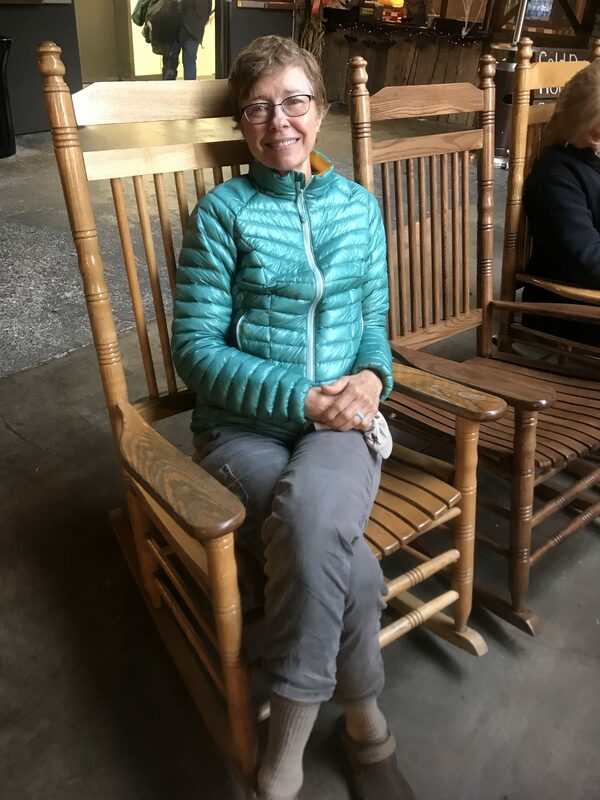 I never missed a day in ten weeks, although crowded shelters in the Smokies sometimes limited it to a few stretches for just five minutes. 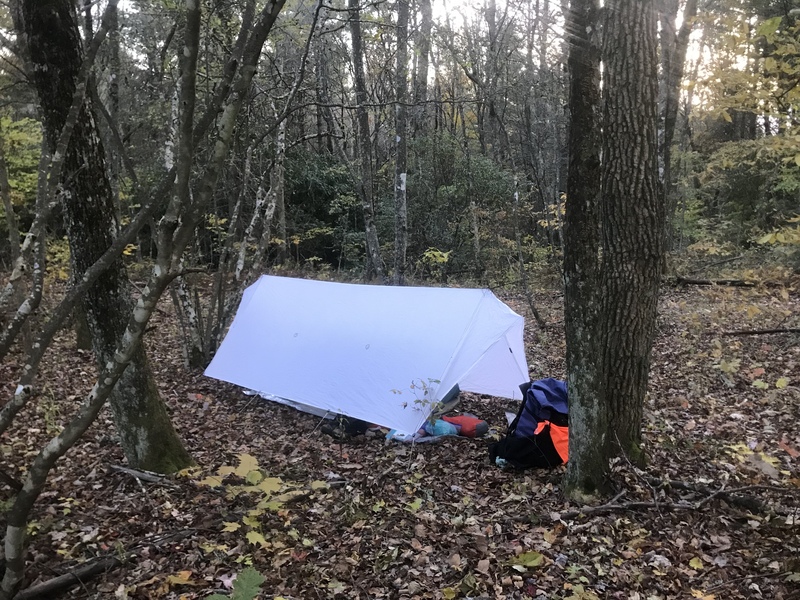 When on the trail, I practiced either on my tent’s groundcloth under a tree canopy or under my tarp in wet or colder weather, or on the floor of shelters. 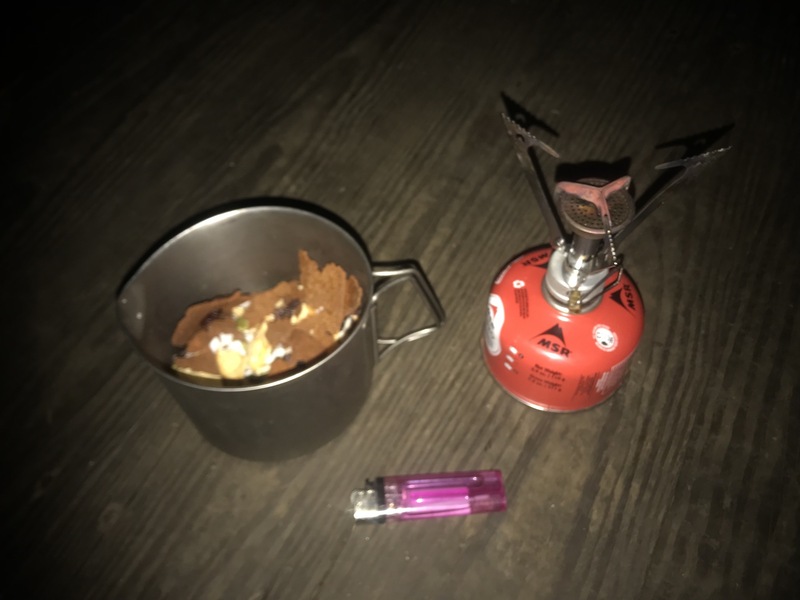 During zero days in a hostel or hotel, I especially enjoyed spending up to 45 leisurely minutes, either in my room, a quiet common area, or outside on my groundcloth. A small hard rubber ball I brought was also great for rolling out sore areas. I know without a doubt that this helped my body continue to work well and avoid any injuries. It also put my mind in the right place each day for fully appreciating the trail. 4. Continue to follow my nutrition plan. Because of some health issues in the past, I have a multitude of food sensitivities, such as gluten, dairy (cow), nuts, nightshade vegetables (potatoes, tomatoes, peppers, eggplants), and all grains or pseudograins. I can consume wine and dark chocolate in small quantities. Too much of any of the above foods produces inflammation, which equals painful knees and hips. I’d rather hike free from pain than eat a potato. 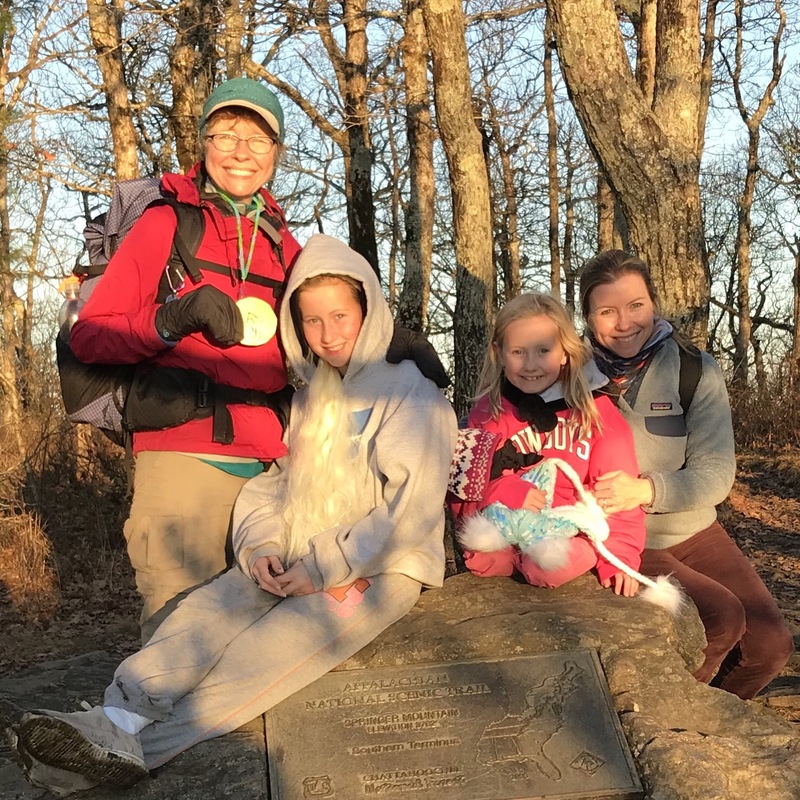 Eliminating dark chocolate, given my trail name of Chocoholic, was a true hardship, but I rewarded myself with a few pieces upon reaching Springer Mountain. To continue my eating plan, I dehydrate all my food in advance at home, vacuum seal it, freeze it, and organize it into daily menus in gallon-sized ziplocks. My husband mails these to me every four days or so. I certainly couldn’t do this hike without my special diet and his invaluable help. Thank you, dear! I look with envy as folks scarf down Reese’s peanut butter cups on the trail or pizza in town. But I have found gluten-free pizzas at several restaurants along the way, and I just remind myself that feeling pain-free is so much better than a momentary pleasure. Even though I already made and froze most of my food last year, I’m presently busy dehydrating some new things. It’ll be good to change up the menu a bit. I’ll eat the older “rejects” when we go kayaking and camping down in the Everglades in February. 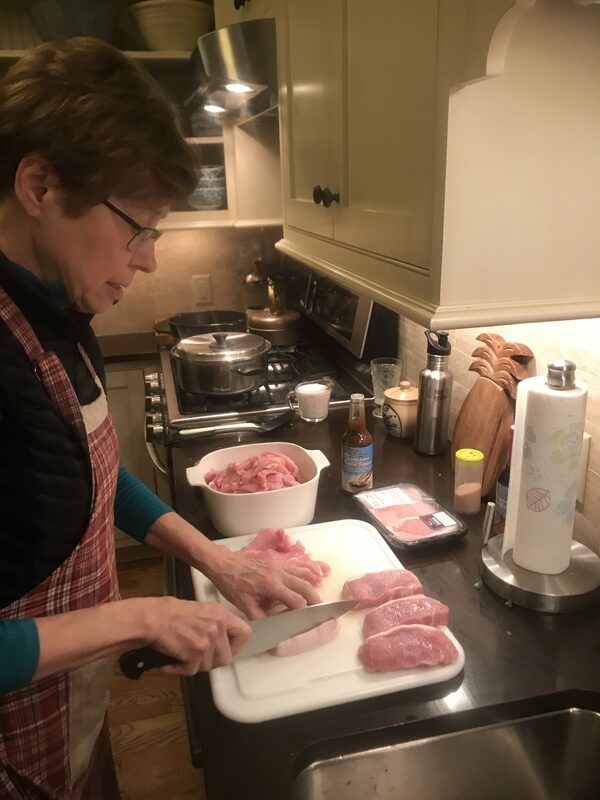 Cutting pork chops into strips for pork jerky. I soaked these in Coconut Aminos’ teriyaki sauce and dehydrated them for 12 hours. My favorite trail treat (when I’m not eating dark chocolate)! 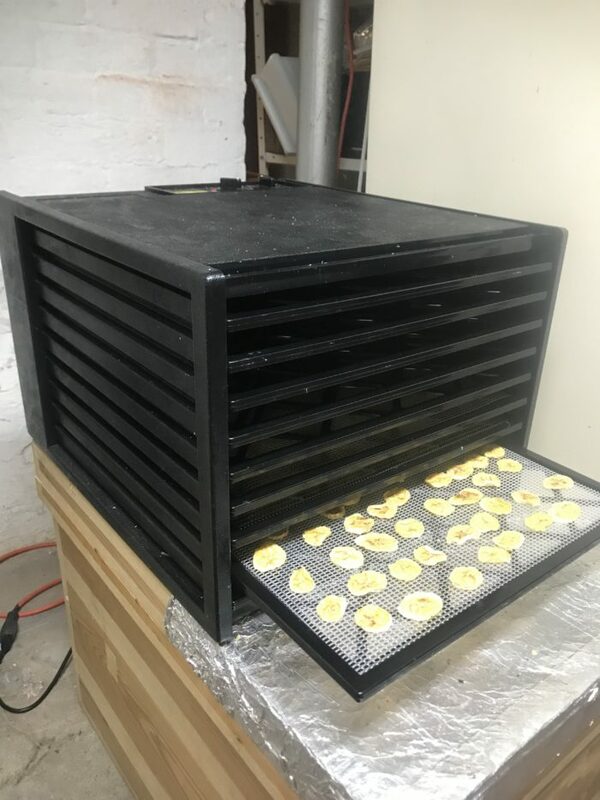 My nine-drawer Excalibur dehydrator. You can get a lot of food done in one batch, but it takes around ten hours each time. When you’re preparing all your meals and snacks for 7 1/2 months, it takes a lot of time. But it’s so worth it! (Rayjardine.com). This was self-made from a kit in 2017, is lightweight, and has great ventilation that avoids interior condensation that could make this cold-blooded backpacker even colder. This replaced my Ray-Way backpack last year, due to the need for a hip belt to ease my back’s load. It worked out great. I love how this backpack feels on my back, and the pockets on the hip belt are very roomy. With good planning, I was usually able to get everything I needed inside the bag. My first day back on the trail after a long absence of 12 months. Love this trail, love this backpack! I use this for the cooler seasons and really liked it. During my final coldest weeks this year, I added a Sea to Summit Thermolite Reactor Compact Plus Liner. This gave me the final protection from the cold that I needed. I discovered that it worked best if I put my quilt inside the liner, which kept any cold spots around the edges from appearing. The mummy hood of the liner was also more effective this way. That tightly cinched hood, plus my finger flicking from the inside, kept an inquisitive mouse from climbing in right by my cheek. During the summer months, I use my lighter Ray-Way synthetic quilt. Who is this dog sharing my quilt and air mattress? Go back to my “Lost and Found” post. This dog’s worth the effort. With an R-Value of 5.7, this was the warmest option I could find. I was happy with the comfort of the mattress, and it kept me warmer than any other air mattress could. But on that 15 degree night in the Smokies? Only a Hampton Inn would have done the job. I use a lighter NeoAir in hotter months, but will probably keep this one with me for the entire northern half. Being unable to throw a rock high enough to safely protect a bear bag, I decided to go with a bear canister in 2018. It proved to be a very good choice for my needs. I must be able to protect my food at all cost. If I lost it to a bear, I would be unable to continue on my hike. I couldn’t even eat any food kindly offered by other hikers. So I chose the smallest, lightest and, unfortunately, most expensive canister out there. It weighs 28 ounces, holds 500 cubic inches, and is eight inches tall. I have worked out exactly how to fit it into my backpack with my other items over, under and around it. I can cram four days’ food inside it, along with my food-scented cook pot. I feel so much more secure knowing that my food is safe. I’m willing to carry the extra weight. My bear canister amid the rubble of the contents of my backpack. This was early one windy, frigid morning atop a mountain. I was having trouble forcing myself to get out of the wind protection of the tarp. Note how the lid of the canister is attached to the body of the canister by a strong wire. A very clever precaution, considering how backpackers’ minds go numb at times, such as on windy, frigid mornings. I will most probably keep this, although I’ve been tempted to update with the slightly smaller and lighter Pocket Rocket 2. However, the difference is negligible and I like my present stove. This being post-holiday season, I’m also feeling overwhelmed by all the material possessions we own and how quickly we are ready to buy more. Our unwanted items end up adding to the pile of waste filling our land and oceans. So, yeah, I’ll probably keep the old one. It looks like this dehydrated meal is awaiting water and heat. See above. There’s also a “new and improved” version of this. We’ll see if I can resist the pull of new gear, since I know it’s not necessary. My present filter works fine and doesn’t weigh much more. I know, trail runners are lighter and help hikers cover more miles. But they have also given me bad tendinitis and plantar fasciitis on two different occasions. Also, I’m not chasing after the mega miles. 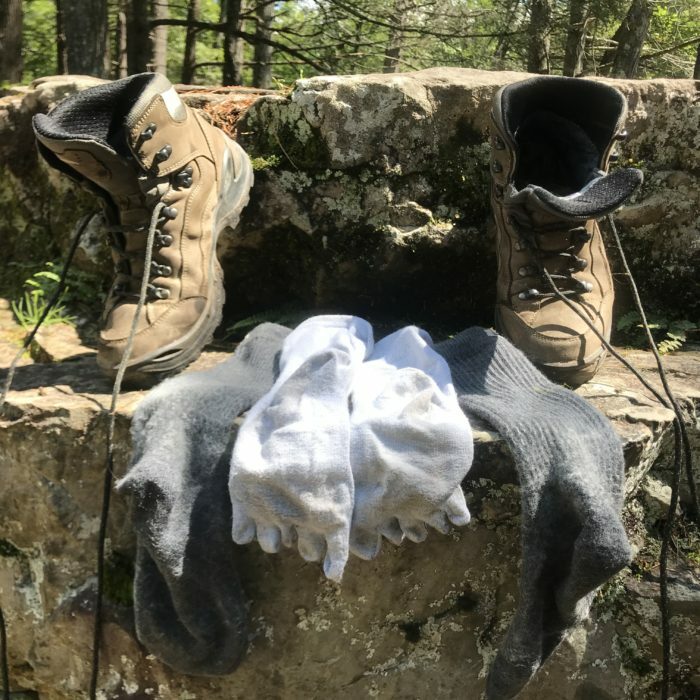 These hiking boots fit my feet perfectly, and have served me well climbing Mount Kilimanjaro, hiking in Patagonia, and covering 600 miles on the AT in 2018. Not one foot issue. I’m keeping ’em. These have lifetime protection from all insects, thanks to a special permethrin treatment by insectshield.com. Check it out: you mail them your own clothes and they treat them for you, which lasts up to 60 washings, as opposed to six to seven washings with self-sprayed permethrin. These pants work perfectly for me in all temperatures. I only use them as shorts when I’m in town in hot weather. Otherwise, I stay as protected from ticks as I can, with long pants and long sleeves. Pants stylishly tucked into ankle gaiters in hopes of thwarting those pesky ticks. This has UPF 50+ and I also had it treated by Insect Shield. It gives a ton of protection, but is very lightweight. Even in hot weather, I usually keep the long sleeves down. However, they can also be rolled up and held with a tab. I love this shirt. It has served me so well. Lightweight, warm, great. A hood would have been nice, but my stocking cap and neck gaiters take care of this. I use this in so many ways. Very useful. In colder months, I also bring a warmer, fuzzy one by Buff. Love it! I sleep cold, so these are a must. I bring a few more tops in the coldest weather. These are made of soft merino wool that refuses to get stinky. Very comfy and much more tolerable than my previous synthetic undies. Injinji is the only brand of socks I wear in normal life, so of course they come to the trail with me. My toes have been completely free of blisters, and, again, wool doesn’t stink. 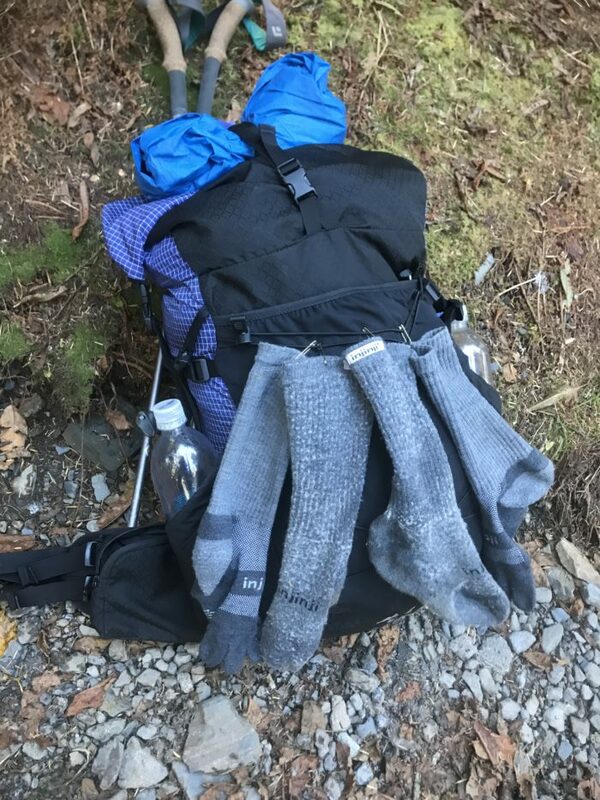 Laundry day for a deserving pair of hiking socks and sleeping socks. So lightweight, easy to put on, and versatile. It also provides a good sitting surface. I’ll probably replace my present one, since I practically wore it out, especially as a ground cloth under my tarp. 2018 was my first year to take camp shoes, because of the switch back to hiking boots. I found these lightweight water shoes to be perfect for my needs. Pretty easy off and on, very comfortable around camp and walking in town, easy to smash flat and fit into a backpack, and handy up north when I need to cross some streams. I presently use a Marmot rain jacket, but want to replace this 11 ounce model with something lighter. I’m considering the Zpacks Vertice or the Outdoor Research Helium II. 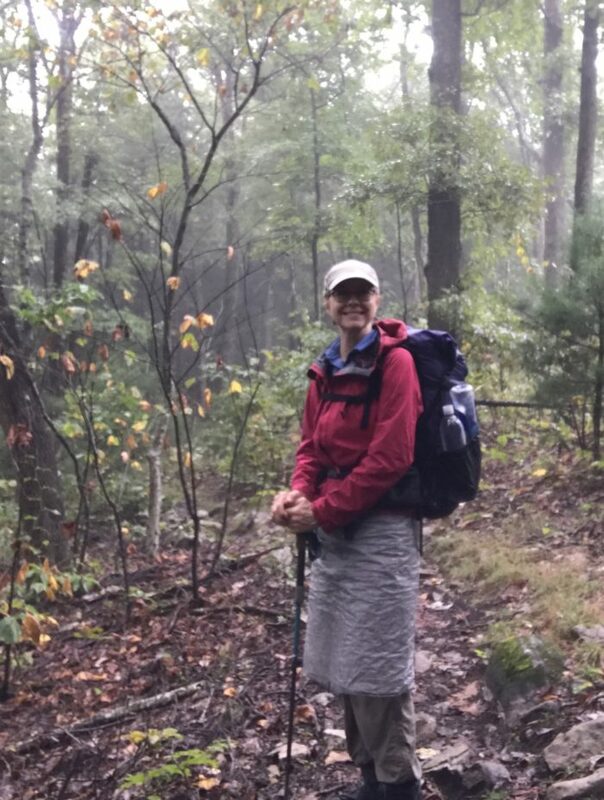 I’d appreciate any personal recommendations from those of you who have trail-tested rain jackets. Although I liked my Zpacks rain gaiters, they tore up after 400 miles. At $75 a pair, I’d rather not go through three pairs this coming season. Any suggestions out there? Even though it’s one of the lightest weight emergency devices out there, I found that its success rate of actually getting messages through was pretty poor. They admit in their instructions that you do much better if you’re in a large clearing free of trees. 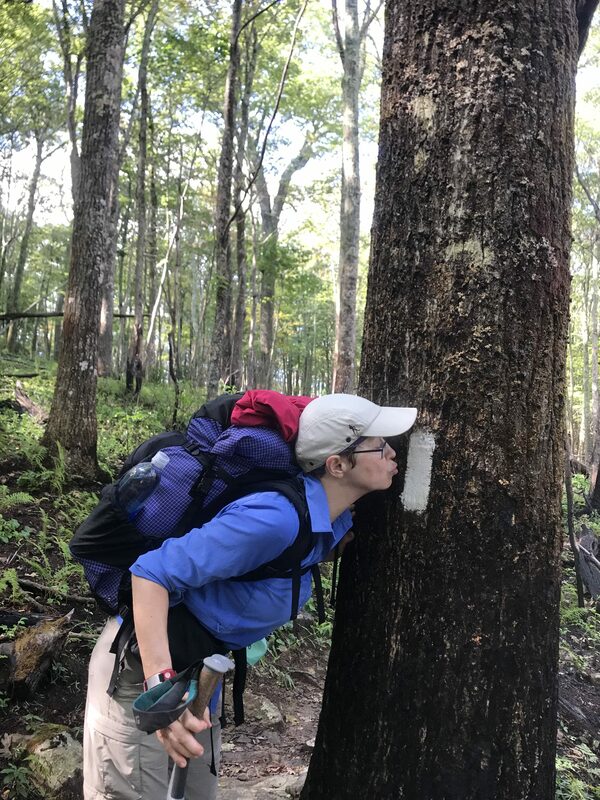 How often are we gonna find that on the AT? If I had a real emergency, I couldn’t count on this device. I’ll either get the new Garmin inReach Mini, or do without. I prefer (b). For keeping my husband posted as to where I am, I will continue using the Gutthook app. With Verizon serving my iPhone, I usually have coverage when up on the ridges. Well, that’s pretty much it. Through research, trial, and error, I have found what works well for me at the present time. I hope this helps other backpackers, as I continue to be helped by others’ posts and blogs. See you all on the trail on May 1! I’ll be accompanied by this fellow again during my first four to five days. Together 47 years; can you believe it? Why stop now? I have the Garmin InReach Explorer+ and the Mini. I can tell you that the Explorer+ is far more reliable, and the battery last FOREVER. The Mini is the first true Garmin, since they purchased Delorme, and it’s just not that great. Even with most of the options off, I can get about 24 hours max. They advertise 50. Ha! There is about 3oz different between the two models, but the battery life difference is huge. 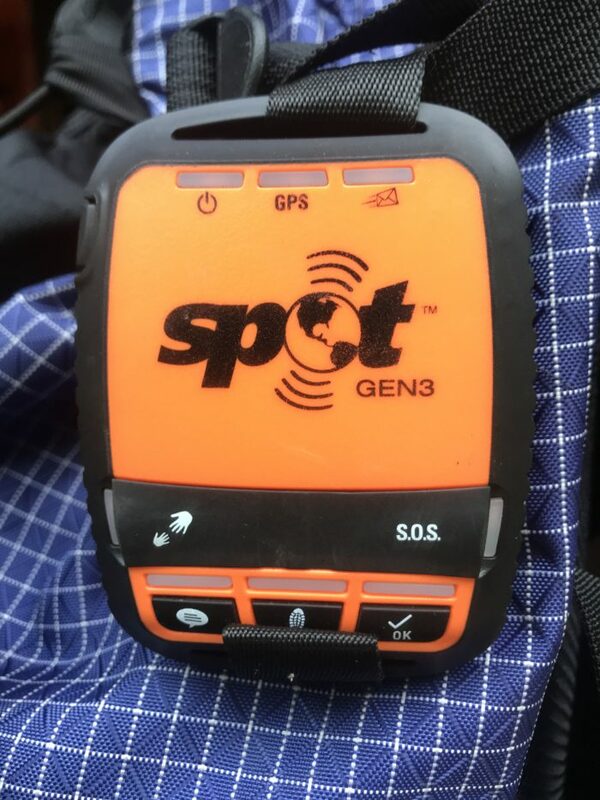 Im Thru-hiking in 2019, and will probably switch my plan back to the Explorer+, and eat the additional weight, for the better battery life and reliability. Thank you so much for your input. I’ll check out the Explorer. Frankly, I just don’t feel I need to carry one of these, though. I’ll be heading north from Harpers Ferry with other flip flippers, and the early or fast NOBOs will catch up and pass me, so there’ll be people around to help in an emergency. Surely more than in early November in NC and GA.
We’ll see. If my husband went w/o me (instead of our reversal), I’d appreciate knowing he’d have help available in case of a real emergency. I’ve been surprised how tasty the simpler homemade jerkies can be. Since I can’t eat snack bars or nuts, I turn to jerky and dried fruit as my carb and protein snacks. Thanks for your comment. I’m excited about getting back on the trail. Hi Ruth, great article!! I loved the part about your boots, I’m really struggling to find adequate trail runners. I have a suggestion on the rain gear, a poncho. There are lightweight ones out there. Bear Grylls, or the UL frogg toggs poncho. Then there is the Snugpak patrol poncho or Terra Hiker Rain Poncho, Waterproof Raincoat with Hood. Anyway pretty handy when it’s pouring like on the AT, and you can swivel your pack around in a downpour and eat under it or whatever. Thanks again for your article! Great suggestions. Thank you! I actually used cheap ponchos over my expensive raincoat two different times. I was impressed how well they worked. I’ll give this serious consideration, especially since I don’t use a pack cover, just an interior trash compactor bag as a liner. I’ve considered Zpacks poncho as well. I just have to be ready to accept wet forearms. Jeff, one more thought, which I forgot to put in my previous comment: I feel like there’s so much hype about trail running shoes (especially Altras) that people feel compelled to go that route. I’m sure many folks are happy with their trail runners, but others change shoes multiple times, looking for comfort. I feel that it’s up to each of us to think for ourselves and make informed decisions, not just automatically follow the trends. Trail runners are one good option, but that doesn’t necessarily make boots outdated or foolish. I felt very protected and secure in mine, and the soles of my feet didn’t feel abused by the rocks as they had in 2017. I hardly felt the need to take them off in camp, but did so as a precaution and to air my feet. Good luck. If you shop at REI, you can return any used shoes or boots within one year. I returned my first pair of Lowas after a few months of training for the next size up, for room for swelling feet and toes. I’ll start from Harpers Ferry in my present pair (relatively new) and will be ordering a replacement pair this year probably right after Rocksylvania. I just turned 60 and love to hike. Have a few section hike under my wing. Enjoyed reading of your trek and adventures . Messaged you on Facebook…sorry. Good luck in May! Hi, Vicky. Thanks for checking out my blog. Sorry I didn’t check Facebook. I literally never do. Meanwhile, I hope you have some good hikes planned for this new year. In our 60’s, we’ve got to keep all the muscles working so that we’ll still have some fun decades ahead of us. I don’t think you can go wrong w/either of your raincoat choices but I am a bit of a Zpacks fan personally. I had Dirty Girls in 2017 when I hadctrail runners. But I don’t think they’d really work well with my hiking boots. Not roomy enough. But thank you for the suggestion. Happy New Year Ruth! Glad to hear you will be heading out again. Wishing you the best ever. I see in the picture you are studying your “Recipes for Adventure” which I used for son Jared’s hike. I learned that if you can cook it, then you can dry it. 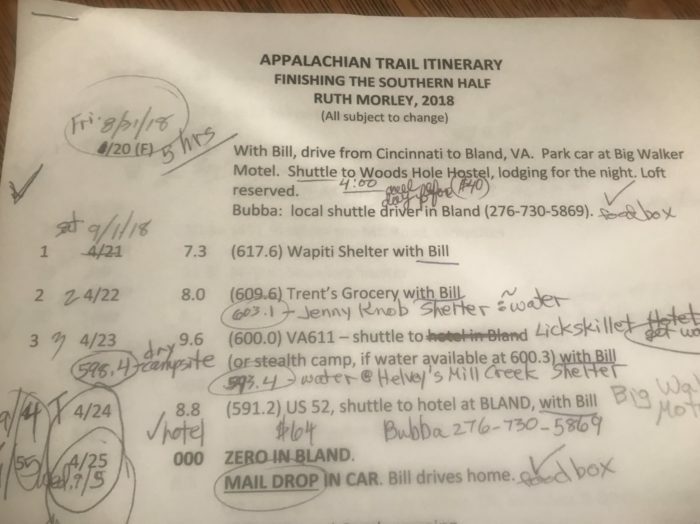 Jim’s shuttle list ended at 950+ and so far this year we have had 2 hikers – one of them here in town now due to ice accumulation on everything. She has a cute little dog and they go by Dorothy and Toto. 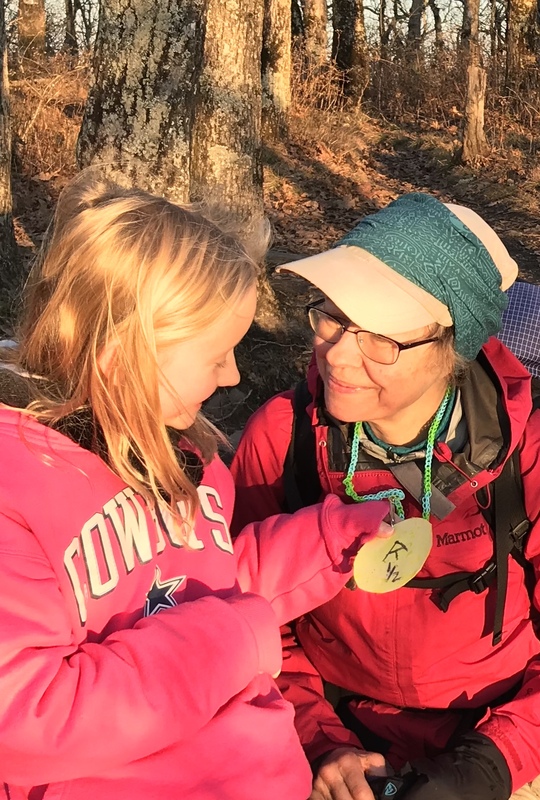 She is going south and has been on trail since August.